Entry No. 157, Chirita Collection, exhibited by Beverly Williams. Score: 92. First Place. Entry No. 260, Sinningia Collection, exhibited by Karyn Cichocki. Score: 87. Second Place. Entry No. 395, Chirita Collection, exhibited by Richard G. Carr. Score: 84. Third Place. Entry No. 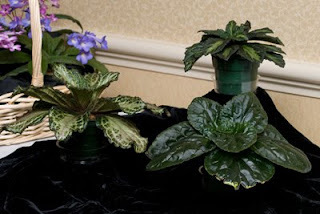 380, Episcia Collection, exhibited by Richard G. Carr. Score: 81.